The future is here — but for a limited time only. 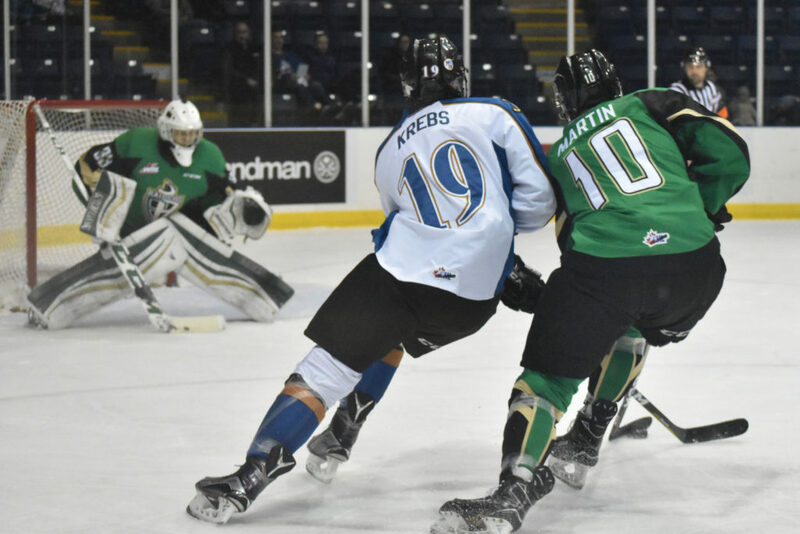 Playing as an emergency call-up to aid a depleted Kootenay Ice lineup, Peyton Krebs proved on Wednesday night that he is everything he’s been hyped up to be and more. The 15-year-old first overall selection at this summer’s WHL Bantam Draft had an unbelievable game against the Prince Albert Raiders, scoring his first WHL goal and picking up three assists in the team’s 6-3 victory. Krebs was named the game’s first star for his efforts and after the game couldn’t wipe the smile off of his face. As an underage player, Krebs will only be able to play in the team’s two games over the weekend before he has to return to his Midget AAA team. While he is eligible to return after his team’s season and playoffs have ended, it won’t be until next season that he can play regularly. Despite his short-window with the Ice, his future teammates are thrilled to have him — for now and down the road. Despite the special ending, the Ice had a rocky start with newly injured players Vince Loschiavo, Ryan Pouliot, Barrett Sheen, and Sam Huston all joining Nikita Radzivilyuk in the press box for the night. With the alternate lineup, Prince Albert took advantage and scored in the first two minutes of the opening period. They held the one-goal lead into the intermission and then scored again just three minutes into the second period. And then, the Krebs’ show took over. On a power play chance right after Prince Albert’s goal, Krebs fed the puck across the ice with a beautiful stretch pass to Max Patterson, who in turn threw it in front for Brett Davis, who beat Raiders’ goalie Ian Scott. Noah Philp then got a tying goal midway through the period, jamming one in, right in front, off a pass from Kroeker. Then at the end of the second, Krebs fed Patterson the puck again who walked in and went top shelf, sending the Ice into the second intermission with a lead. Although head coach Luke Pierce was not happy with every aspect of his team’s game, he was encouraged by the way they handled adversity. The team’s three goals in the second period broke a recent spell of tough second periods. During their three-game road trip last week, the Ice let in 10 goals in the middle frame. Patterson credited their bounce back in second period play as a testament to being smart and working hard. Although the Raiders knotted the game up early in the final frame after the Ice collapsed too deep and let Max Martin fire a bullet from the point that found Jordy Stallard who beat Payton Lee, the team stayed resilient. Nine and a half minutes into the third, Krebs had his big moment. Winning a draw to defenceman Kurtis Rutledge, Krebs skated to the front of the net where Rutledge drove around the net and found his stick. His first goal was enough to give the Ice their first win in four games and sent Western Financial Place into a frenzy. “There’s no question [that] he’s gifted,” Pierce said on Krebs’ stellar play. “He does some things that are not coachable traits. He’s just got a mind for the game and sees the ice so well. He wants to win and that rubs off on our guys. Kroeker scored an insurance marker less than a minute later and Max Patterson put in an empty netter from Davis and Krebs to cap off a big night for all of them. Overshadowed by the exploits of the exhilarating forwards, Cale Fleury quietly had an impactful night in his debut as the team captain. He credited some of the team’s success to the excitement of new alternate captains Austin Wellsby and Kurtis Rutledge. Fleury was also very encouraged by the play of the team’s young players and is thrilled to be the team’s leader going forward. Standing tall in net, Payton Lee was also a huge factor in the win, piling up 40 saves in a game where his team was outshot 43-27. The Ice now travel to Tri-City to play the Americans, where Krebs will face off against his brother Dakota in what will no doubt be another exciting game for the Ice’s phenom. Puck drop against the Americans is at 7:05 p.m. PST and the Ice play the following night, at the same time, in Spokane against the Chiefs.